SpongeBob Squarepants is a children's cartoon airing on Nickolodeon that focuses on SpongeBob, who lives in a pineapple under the sea. That's how the theme goes, at least. SpongeBob lives next door to Squidward Tentacles and Patrick Star, and he works with Mr. Krabs at the Krusty Krab. Not only that, his friend Sandy the Squirrel lives in a "tree dome" and walks around the ocean floor with the help of an underwater suit. The comedy centers around SpongeBob's naivete, but that naivete makes way for a great deal of adult humor. This is the sort of show that allows adults and kids alike to laugh heartily. Kids will laugh at the typical sort of slapstick comedy that comes with cartoons, but adults will find that there is a great deal of adult humor hidden in the dialogue that would only be noticed by grown-ups. At times, grown-ups would have to walk a particular episode more than once to catch all the inuendo and adult jokes. SpongeBob does deal with issues that kids are faced with everyday like school, because SpongeBob is still in boating school, work ethic, because Squidward is lazy at work, and friendship, because Patrick and Spongebob are inseparable. This is perfect type of cartoon for families because everyone can enjoy. Parents will find it much easier to sit through these cartoons because they will have something to watch. No more nodding for the parents, and there's much more fun in store for the kids with every new episode. The Nitwitting: Patrick inducts SpongeBob into his prestigious society of dullards and doofuses. Patrick inducts SpongeBob into his prestigious society of dullards and doofuses. Patrick takes his grime to a new extreme, playing around in so much trash that he becomes unrecognizable. SpongeBob and Patrick have their peaceful day of jelly fishing disturbed by Sandy's competitive nature. SpongeBob pulls from Squidward's shirt a loose string that never seems to end. Plankton goes to jail, but the secret formula is taken as evidence! SpongeBob and Mr. Krabs plot to get it back. Sandy struggles to build a ship-in-a-bottle before a big contest, so SpongeBob calls in a little extra help. SpongeBob visits his old pal Bubble Buddy's hometown... Bubbletown! Sandy invites Karen and Mrs. Puff out for a night on the town, so the ladies decide to blow off some steam. The long-lost episode of Mermaid Man is finally showing on TV, but will SpongeBob make it home in time to watch? Karen gets a computer virus, and it's up to SpongeBob to get it out of her! Plankton goes to jail, but the secret formula is taken as evidence! SpongeBob and Mr. Krabs plot to get it back.Sandy struggles to build a ship-in-a-bottle before a big contest, so SpongeBob calls in a little extra help. When a gang of kids steals the Krusty Krab's grill, SpongeBob and Mr. Krabs go to extreme lengths to win it back. SpongeBob helps out the Krusty Krab's night shift crew, but the customers crave something creepier than usual. When Patrick discovers the pineapple’s library, SpongeBob introduces him to the wonderful world of book learning! When The Krusty Krab runs out of mustard, Mr. Krabs sends SpongeBob, Patrick and Squidward to dig up some more! SpongeBob and Sandy have to collect Krabby Patty ingredients, but Plankton is following their every step. Plankton tells Patrick he's his conscience so he can convince the wooden-headed star to steal him a Krabby Patty. When Mr. Krabs puts in an open kitchen, SpongeBob gets stage fright and has to invent a new persona. Mr. Krabs hires Squidward to babysit Pearl for the night, but she just wants to sneak out to a cool teen party! After spilling a milkshake during a delivery, SpongeBob vows to return and clean the entire building! Now that Fred's leg has healed up, SpongeBob is determined to keep it out of harm's way...no matter what! Patrick's lemonade stand isn't doing too well...until he gets a secret ingredient from Squidward! When Mr. Krabs gets in trouble for littering, he makes SpongeBob and Squidward clean up Bikini Bottom. A sea bunny ravages Squidward's garden, but SpongeBob thinks it's cute! SpongeBob wants to be the first sponge to dive all the way up to the surface of the ocean! When SpongeBob and Squidward accidentally let Plankton steal the secret formula, it's up to them to steal it back! SpongeBob and Patrick become trapped in an alternate dimension where anything they draw comes to life. SpongeBob and Patrick help Bubble Bass move out of his mother's basement. SpongeBob and Patrick exchange tiny living versions of themselves. It's a whole hunk of homunculus fun! Plankton tells his Grandma that he owns the Krusty Krab, but must keep the lie going when she comes to visit. SpongeBob can't drive, but you don't need a license to operate a self-driving car! Patrick thinks he's an old man, so it's up to SpongeBob to remind him how much fun being a kid can be! Gary has a pet translation collar, and he's talking up a storm; when a small clown gets left behind by the circus, SpongeBob takes the hapless harlequin under his wing. SpongeBob's new friend is a giant fluffy hamster. There's one problem, though: no one else can see him! Guest Voice: Jeff Garlin Patrick wants to be a horse! The Flying Dutchman wants to make sure SpongeBob and his friends are scared on Halloween. When Man Ray rents Squidward's house for the weekend, it's up to SpongeBob and Patrick to stop his evil vacation!Mr. Krabs takes a vacation and makes Larry the Lobster the temporary manager of the Krusty Krab. The more than 16 million ‘friends’ of “SpongeBob SquarePants” will have access to a special treat on Thursday ,when Nickelodeon shares a new 15-minute episode of the cartoon via Facebook. SpongeBob’s friends have been given special instructions on how to view the new episode, called “Trenchbillies,” - a privilege that grants them first-to-see access for the show featuring guest star Amy Sedaris. SpongeBob SquarePants is currently available to watch free on Nick, Noggin and stream on Nickelodeon. 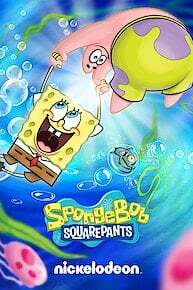 You can also stream, download, buy, rent SpongeBob SquarePants on demand at Amazon Prime, Philo, Amazon, Vudu, Sling, FandangoNow, Google Play, DIRECTV NOW, iTunes online.